Today was the fire station family picnic and we all gathered together for a good meal and some great conversation. As things were winding down the chief said that we should let the kids jump on the beds before we left and so some good old fashioned monkeys on the bed commenced. That is until one little monkey fell off and...you guessed it bonked her head. I guess if you are going to have an accident it is ideal to do it in the middle of a fire station surrounded by Daddy and his fire fighters. Off we went to Dell Children's Hospital to get our sweet little one all patched up. #2 and the Back Cracker picked up Super Son and took him to Grama & Grampa's for Grampa's birthday party and because as he said "I don't want to see what they are going to do to Miss Thing's chin when they fix it." 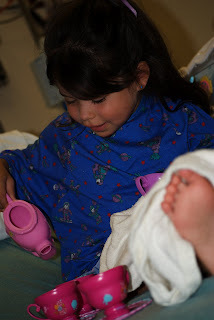 The child life specialists talked her through what was going to happen and let her touch all of the instruments. We hoped that they would glue her wound, but when it was all said and done we left with this. 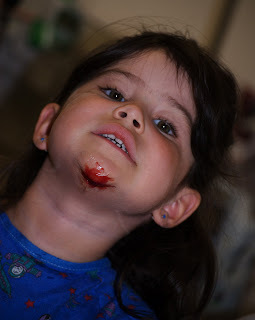 5 stitches and she is all put back together now and proud of herself for being so tough. She is surely one tough little girl. AHH stitches! ::shudder:: You've got a brave little girl there. Isn't it amazing how much facial wounds bleed? 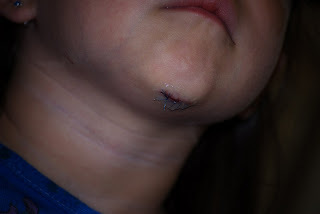 Will had five stiches in his eyebrow earlier this year--not fun, I know, but she looks like she handled it quite well!